There was a REVOLUTION of sound and explosions on the Champ de Mars last night. 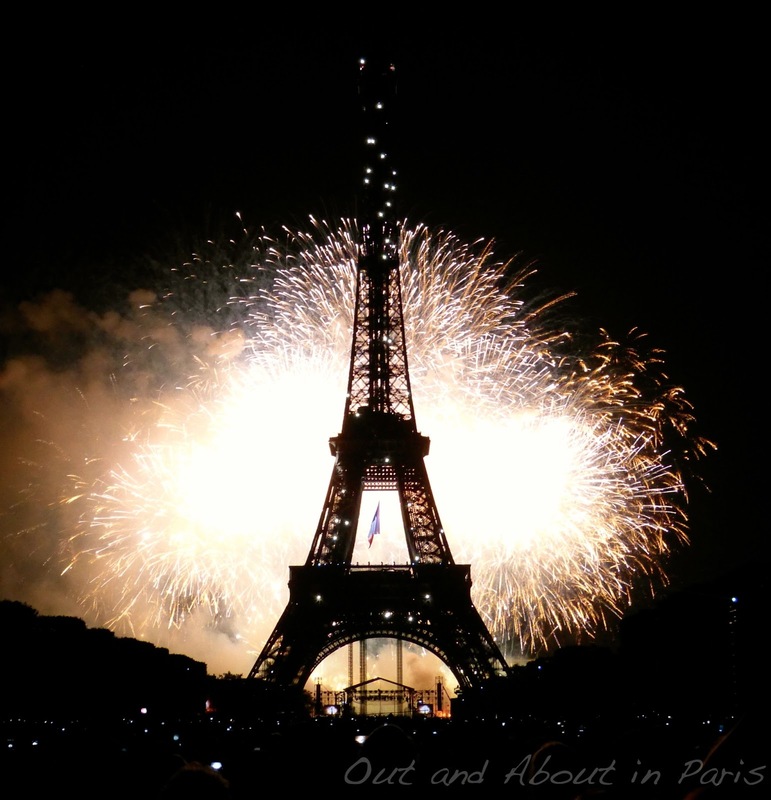 If you would like to relive Bastille Day (La Fête Nationale) 2013, here's the spectacular firework show in its entirety! Please click here, if you would like to view the complete album of photos that I posted on Facebook. Great pics as usual! Were you at the Champs de Mars for a long time? We started walking around Trocadero about 7:30 but they had closed the esplanade, so we headed down to the river. The first place they would let us get close was at Pont d'Alma, so we waited right there by the riverside for 3 hours. LONG time. So, my pictures are very different from yours, they include some boats as well, but it was a great experience. Not sure one that I will soon repeat, unless I find my camping chairs! Camping chairs is an excellent idea! Our daughter and her friend went to the Champ de Mars around 6:30 to stake out our piece of land. The rest of us arrived with the picnic around 7:30. By 8:00, it would have been impossible to find a spot. Despite the crowds, I really like being on the Champ de Mars for the fireworks. People brings picnics, books, playing cards and the atmosphere is one of a big festival. The only downside is the walk home afterwards because it's impossible to get in the nearby metro stations. Wow, I guess we could have found a spot if we had continued then. As I said, we left home around 7:30 to do a 'recon' of where to go, but quickly discovered that our recon had better not end. So, we had no equipment, i.e., food, hahahaha. We were pretty happy that we only had a nice walk home however. You're right, the metro stations were backed up onto the street. Loving city life! I did kind of like the fact that our fireworks were not narrated however. After watching the video, it's kind of nice to put one's own perspective on what you are seeing. At any rate, another great show put on by gay Pareee! Fabulous video footage and your own shots are wonderful. Thanks for sharing. Thanks, Nancy! It was a pretty spectacular evening. The only downside was that we couldn't hear the Radio France concert because they hadn't put enough speakers in the Champs de Mars. Other than that, it was wonderful. Great pictures Mary Kay. Wish I was there. Love Denise. Michael and you will be here for the festivities next year, Denise. I'm sure! Thanks for commenting, Jamila! I couldn't tell from your blog when you'll be arriving in Paris but I wish you good luck transitioning to a new city. Let me know if you have any questions! It was thanks to you and Sara that we had such a good spot on the Champ de Mars! 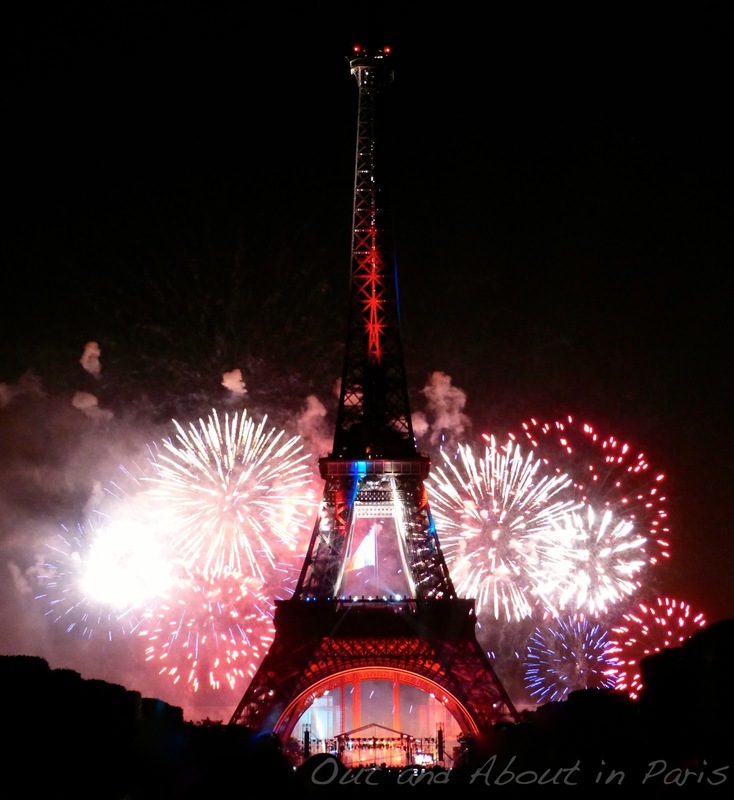 I'm so happy that you were able to celebrate Bastille Day with us this year. We should make it an annual tradition! AMAZING! 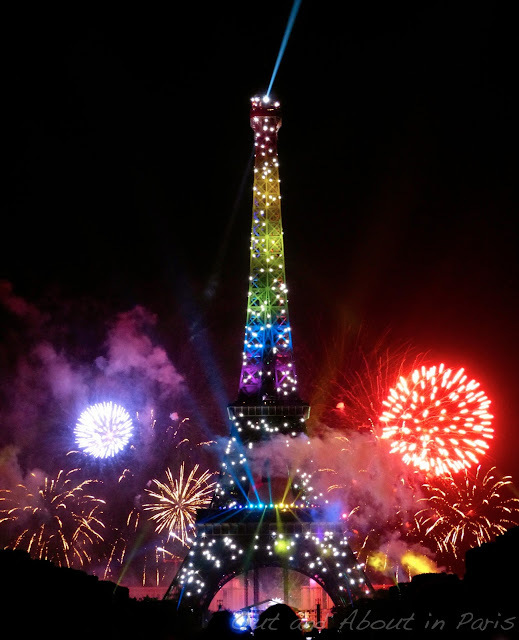 My husband said he planned it poorly when he came back to America while the Bastille Day celebrations were going on. But he also got a memo from work telling him he was going to either be stuck in his apartment or unable to get there during the celebrations! It's a shame that your husband wasn't here for Bastille Day but I'm sure that he was happier to be at home with you! But I guess that both of you are back in Paris now. Bienvenue!